In this video we will discuss, how to pass data from child component to parent component. In Part 33 of Angular CRUD tutorial we discussed how to pass data from parent component to child component. To pass data from parent component to child component we use input properties. In the child component we create a property with @Input decorator. The parent component then binds to the child component's input property. On the other hand, to pass data from child component to parent component we use output properties. The child component raises an event to pass data to the parent component. To create and raise an event, we use EventEmitter object. So the output property is an event defined using EventEmitter object and decorated with @Output decorator. To specify the type of data that we want to pass from the child component to parent component we use the EventEmitter generic argument. In the example below, the notify event is used to pass string data from the child component to parent component. This event data is commonly called event payload. If you want to pass a number instead of a string as event data, then you specify the generic argument type as number instead of string. If you want to be able to pass any type of data, you can use 'any' as the generic argument type. You can only pass one value using EventEmitter. If you want to pass more than one value using EventEmitter use a custom type like Employee as the generic argument. We want the "notify" custom event to be raised when we click on any of the "Employee" panel shown below. 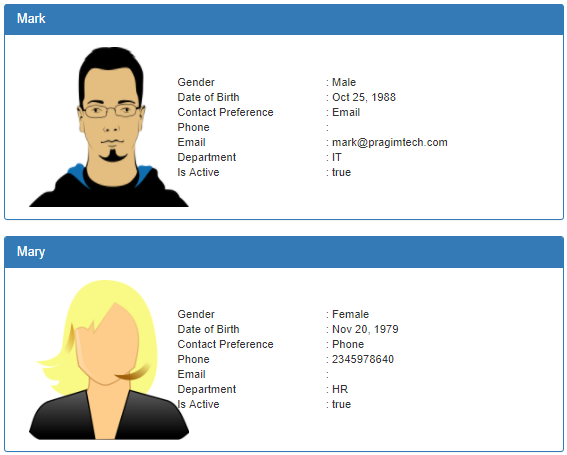 The child component DisplayEmployeeComponent is responsible for displaying Employee details in a Bootstrap Panel. In (display-employee.component.html) file, wire up the click event handler on the <div> element that has Bootstrap panel css classes panel and panel-primary. To raise the custom event, use the emit() method of the EventEmitter object. The event payload is passed as the argument to the emit() method. So in display-employee.component.ts file include handleClick() method as shown below. Now, in the parent component (list-employees.component.html) bind to the custom event raised by the child component. Notice we are using event binding to bind to the notify event. We are handling the notify event in the parent component using handleNotify($event) method. $event is the data from the child component. In list-employees.component.ts file, include handleNotify() method as shown below. This event handler method assigns the event data received from the child component to dataFromChild property. The view template (list-employees.component.html) binds to this dataFromChild property to display the employee name and gender.